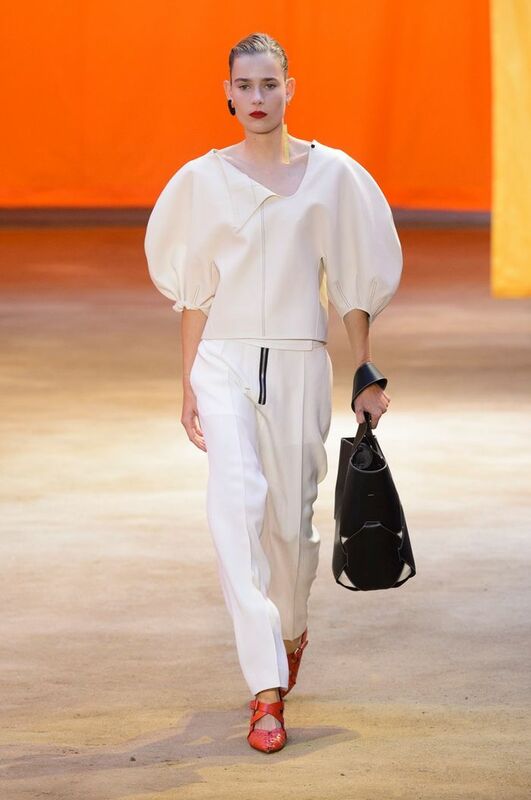 Since Phoebe Philo rebooted luxury French fashion house Céline eight years ago, the label has had a way of dictating what women want to wear for seasons ahead. Her influence has seen us embrace trends we never thought we’d visit—fluffy slides and strait-jacket coats anyone? Fans of the label were waited anxiously this morning to see what Philo would do next for the S/S 16 presentation in Paris—and she didn’t disappoint. This season has continued to see a significant shift against what we’re used to seeing from the label over the past few years. Historically, Philo has stuck to simple shapes, fluid lines and a neutral colour palette, however, S/S 16 is really something to get excited about. Accordion pleats mixed with delicate lace, drop knit dresses in burnt orange and exaggerated shoulders (a sophisticated blast-from-the-past) sit amongst nicely those classic pieces the brand has become known for. Throughout the whole S/S 16 circuit, we’ve seen designers embracing colour, layers, texture and just basically having some fun. The days of head-to-toe grey remain (we all have those days where colour is sometimes just too hard), but for now, getting dressed each day is a whole lot more inspiring. Keep scrolling to see our predictions for the pieces that’ll reach cult-status. 1. The exaggerated shoulder top. 3. The lace, silk and accordion pleat dress. 6. The burnt orange knitted dress. 7. The school-boy tweed set. Which is your favourite look? Let us know in the comments below and then shop your favourite Céline sunglasses at Green With Envy!